Dr. Barrie Tan, seen here in the early stages of construction of American River Nutrition’s plant in Hadley, says he’s “all in” when it comes to researching and manufacturing tocotrienol vitamin E.
For some time now, Dr. Barrie Tan says, vitamin E suffered from what might be considered a public relations problem of sorts. Indeed, the dietary supplement, a noted antioxidant discovered in 1922 and available to the public for decades now, had been drawing mostly unfavorable reviews for its disappointing lack of benefits for cardiovascular health. One large-scale clinical study even concluded that it actually increases the risk of prostate cancer. But Tan, president of American River Nutrition (ARN), stressed that the bad press essentially concerned what would be considered one form of vitamin E.
As he explained, the supplement is not a single compound — contrary to popular belief up until a few decades ago — but rather a family of at least eight similar, yet structurally different, molecules. And while the once-popular vitamin E alpha-tocopherol has seen its stock fall somewhat in recent years, the lesser-known form of the supplement — tocotrienols, as they’re called — have seen theirs rise amid links (through tests on animals) to everything from improved cardiovascular health to delaying the onset of cataracts; from enhanced bone health to cancer treatment and prevention. And it is a product known as DeltaGold, with the marketing slogan “Simply Tocotrienol,” that Tan will be manufacturing at a 25,000-square-foot facility now taking shape in Westmass Development’s Hadley University Business Park, in the shadow of the UMass Amherst campus, where he was once a professor of Food Science and Nutrition. In recent months, the company, the plant, and Tan have been in the news — primarily because the facility will use propane rather then natural gas, simply because there is a moratorium on new natural-gas hookups in that region, a ban that has many concerned about possible long-term effects on economic development and that has also thrust the proposed but highly controversial Kinder-Morgan pipeline even further into the spotlight. But Tan hopes to change the tenor of the headlines concerning his venture, and, in many ways, he already has. Indeed, there’s been a steady stream of articles in various health publications regarding tocotrienols, DeltaGold, and Tan. Most of these stories talk about the supplement’s potential and about ongoing studies and trials. However, evidence is mounting that this natural form of vitamin E, derived from annatto (an orange-red condiment and food coloring derived from the seeds of the achiote tree — more on that later), could have a number of significant health benefits. “We’re engaging a study on cardiovascular benefits, and there are also studies on several forms of cancer,” said Tan, adding that the phrase “Simply Tocotrienol” captures the essence of this development, and its significance, because DeltaGold is considered to be the only natural, annatto-derived tocotrienol that is free of tocopherols. And that’s important because research has shown that tocopherol interferes with tocotrienol benefits, essentially resulting in that aforementioned bad press, he explained, adding that, in 1996, it was first determined that the cholesterol-modulating properties of tocotrienol were found to be compromised by what Tan called a vitamin E “sibling” — alpha-tocopherol. “The researchers concluded that effective tocotrienol preparations should contain less than 15% of alpha-tocopherol and more than 60% of desmethyl tocotrienols [gamma- and delta-tocotrienol],” he told BusinessWest, adding that the only natural source of tocotrienols that fits those tight parameters is annatto, derived from trees grown mostly in Central and South America, but also India and Sri Lanka. Tocotrienol is extracted from annatto, a substance derived from the seeds of the achiote tree. Tan has found a way to extract the tocotrienol from annatto through a proprietary distillation process that produces no toxic or harmful byproducts, and he’s ready to take his venture to a much higher level. For this issue, BusinessWest talked at length with Tan about DeltaGold, American River Nutrition, research on possible pharmaceutical versions of the product, and where he wants to take this company in the years to come. Tan has taken a rather circuitous route to his current station as an entrepreneur and researcher at the forefront of developments with vitamin E. In fact, he summed up that path and detailed what’s transpired over the past several years by borrowing from Robert Frost. “We certainly took the road less-traveled,” he said, referring to what became years of research and development of the far-lesser-known variety of vitamin E, and eventually DeltaGold. It’s a trek that’s taken him from his native Malaysia to Amherst and eventually to South America, where he found not only what he originally set out to find — a plant rich in carotene — but also something more promising, and lucrative, just a few yards away. Our story begins in late November 1982, when Tan arrived at UMass Amherst. He taught there for more than a decade, first in the Chemistry department and later the Food Science department. It was during that latter assignment when he initiated work with vegetable oil and, through that, the tocotrienol form of vitamin E, which he found in palm oil. Research in this area eventually led to formation of a business venture called Carotech, which, as the name suggests, was involved in products derived from carotene. It was later sold to a Malaysian concern. At the time, Tan said, he lacked the skills needed to lead a business, and when the Asian economy tanked in the mid-‘90s, Tan started a lab from which he created American River Nutrition in 1998. He told BusinessWest that he soon put aside work with tocotrienols and went back to researching potential medical uses of carotene. This work took him to South America in early 2000 to search for a plant said to be a potent source of carotene. He found that plant, a much larger version of the traditional, garden-variety marigold, but 30 feet away, he found something else. “It’s what the British call the ‘lipstick plant,’” he noted, referring to the achiote, which bears a red fruit, or seeds, which natives of that region used as body paint and, yes, lipstick; other uses include the coloring of cheese, margarine, fabric, and other products. But Tan made another key discovery. “The chemist in me hypothesized a theory,” he explained, “which is that there must be something very powerful that protects the carotene color from this annatto, which is not protected otherwise, from degradation. I wondered what it might be. Fast-forwarding a little, Tan said ARN eventually filed a patent and commenced work on a method for effectively extracting this new form of vitamin E, one free of tocopherol, from the plant’s fruit. Over the next six years, research continued into the engineering of a process to extract the tocotrienol and take what eventually became known as DeltaGold to the marketplace. The timing wasn’t ideal — the nation’s economy nosedived in 2008, slowing Tan’s pace of progress with his venture. But a critical mass of sales had been achieved, and solid foundation had been established on which to build. And he’s doing just that — figuratively and quite literally. 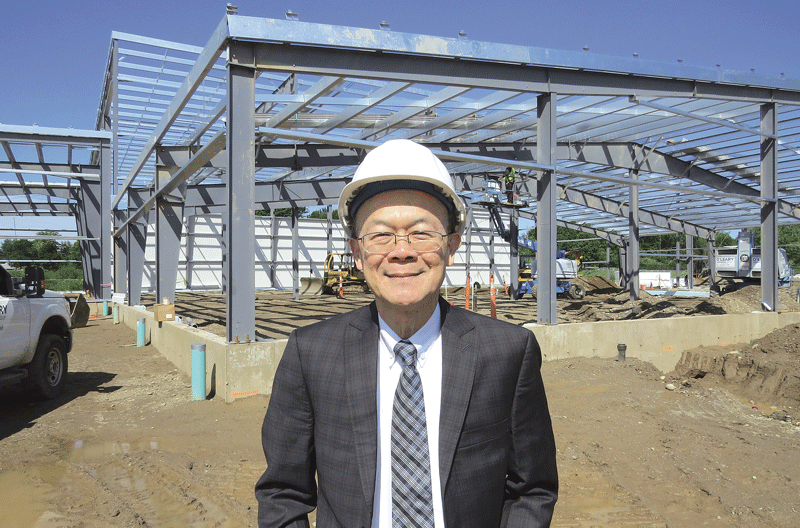 Indeed, with financing from Citizens Bank and the U.S. Small Business Administration, Tan is erecting his facility in Hadley, one in which he expects to grow the workforce from the current nine to 15 or 20. Meanwhile, he’s working to broaden a customer base that already includes a number of manufacturers of dietary supplements and related products, including Nutricology, Biotics Research Corp., Bronson Laboratories, and many others who use DeltaGold in products bearing their brand names. Tan’s undertaking is another gamble, but he remains all in, as he said, because the news on tocotrienols, and especially those derived from annatto, is increasingly promising. One recent study conducted by scientists at the University of Missouri, for example, found that certain doses of tocotrienol, combined with a healthy diet, decreased lipid levels significantly after four weeks. According to another report’s findings, published in Evidence-Based Complementary and Alternative Medicine, tocotrienols from annatto, mainly composed of delta-tocotrienol, stimulated bone formation and cut back bone decay in a post-menopausal osteoporosis rat model. Another study found that vitamin E tocotrienals from annatto may slow the development and reduce the number and size of breast tumors in rats, and still another concluded that annatto tocotrienol may delay the onset and progression of cataracts when given in a topical formulation. “There might be 100 researchers at universities and institutions conducting research on tocotrienols, and they seem to say that they are good for chronic conditions,” said Tan, listing as examples type-2 diabetes and certain types of cancer, such as breast cancer, ovarian cancer, and prostate cancer. Research involving DeltaGold and a number of cancers is ongoing, with involvement from students at the university, he continued, adding that others, as noted, are exploring its potential benefits with cardiovascular health, bone health, cholesterol, and other health issues. Just how that question is eventually answered will obviously be a huge factor in the future of DeltaGold and ARN, Tan acknowledged. But in many ways, the gamble he has taken is already paying off. That chance discovery in South America years ago is bearing fruit in many ways, and this venture has tremendous potential to blossom into a business with national and international reach. Indeed, by taking that road less traveled, Tan and ARN have embarked on an intriguing and potentially lucrative entrepreneurial path.